Denver’s St. Patrick’s Day parade dates back to 1962. For a complete history of the parade, click here. Saturday, March 11, 2017 starting at 9:30 am. The parade will last about 4 hours. To catch the parade entries full performance (dancing, full music sets, etc.) the best spot is south of 2Oth avenue on Blake Street (which will be renamed Tooley Street for the Parade). This is probably the most crowded area of the parade and is standing room only. Folks will arrive as early as 6am to stake out a spot. 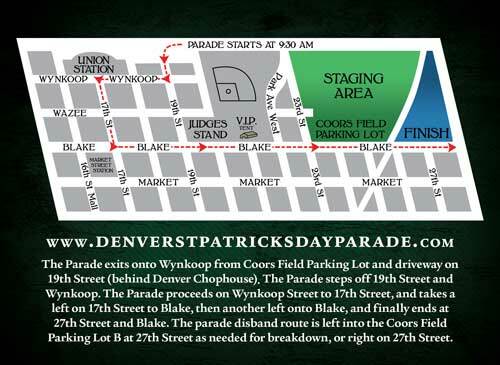 Mass transit is a great way to get in and out to see the parade.The Coors Field parking structure will be available for parking on Parade Day, March 12, 2016. The gate at 27th & Blake will open at 7:00 A.M. and will be closed at 9:00 A.M. This will be the only access point to be able to park in the structure. The parking structure will be open to Parade participants and spectators alike this year. No entry allowed entry before 7:00 A.M. or after 9:00 A.M.